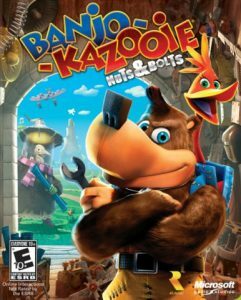 Moving around the canon of Banjo-Kazooie a bit, for various reasons, Nuts and Bolts feels like a late entry for a 3D platforming hero – the genre seemed to be forgotten about around this point. This game draws on some additional influences, mainly advertising a vehicle building game that I’m sure will be useful later. Let’s see whether that works. As the name implies, this game places a heavy emphasis on building vehicles. You get a bunch predesigned, but are encouraged to build your own (which probably is better than the pre-created vehicles). The various levels are accessed in a way to many other of these platformers, themed areas that slowly unlock as you finish missions elsewhere. We saw it in Super Mario 64, but many others have done it since. Pretty nuch all of these missions require the use of vehicles. Luckily there are plenty of styles – light and fast, heavy and slow, and some that can fly – to provide enough variety, but I felt the limits of this system sometimes – I was hoping I could get a bit of platforming out of it each time. Still, the vehicle parts provide you with plenty of collectibles to look for, and at least the gameplay makes for an interesting game, a nice mix of a driving game and a 3D platformer of sorts. There are still some odd touches – and I certainly struggled with some of the “grapple thing and drag it around” setups – but it’s a decent idea. I’m not sure I’m quite as much on board with this game as with other platformers. The driving makes for a nice change as an interesting way to change the formula, but it feels a clumsy at times and a bit repetitive. A world I want to explore, but it’ll take some time.